If you are leading a stressful life or you don’t have time for a proper diet or lifestyle, your health may be in danger. Fortunately, there is Turmeric Plus Superfood supplements that can help your body and mind to stay in shape. Turmeric is considered one of the most potent superfoods because of its powerful anti-inflammatory effects and antioxidant properties. How Magically the SuperFood Works? 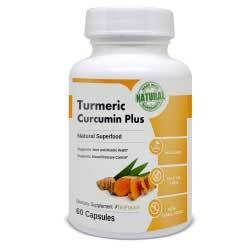 Turmeric Curcumin Plus SuperFood is a dietary supplement that provides an all-around health boost. It utilizes a powerful combo of Curcuma-based ingredients to take care of both your body and mind and promote your overall health. The product is completely natural, which means that it won’t cause any side effects and is safe to be used by everyone. You are probably aware of the fact that turmeric is a popular spice. In fact, you probably used it yourself in at least several occasions. But did you know that this plant that belongs to the ginger family also has powerful medicinal properties? Thanks to the generous dosage of this compound in Turmeric Curcumin Plus SuperFood, it can help to relieve joint pain and promote anti-inflammatory response and brain health. It can also be a part of your weight loss regime due to its antioxidant properties and the capability of boosting the body’s metabolism. 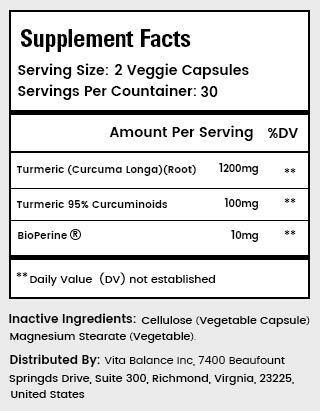 Vita Balance is the manufacturer of Turmeric Plus Superfood. They are a US-based company servicing North American and UK markets. The company has been in the business of making natural health products for years, and they currently have more than 35 products in their portfolio. Some of them include Raspberry Ketone Plus, Anti-Anxiety Plus, and Prostate Plus. The company is dedicated to meeting and exceeding consumer’s expectations and delivering innovative and effective health products that comply with strict standards and regulations. They say that the secret of the best health supplement is in its simplicity. That is probably why Turmeric Curcumin Plus SuperFood focuses on the potency of ginger and utilizes its properties to boost your overall health. If you take a look at the list of benefits of the Turmeric Curcumin Plus SuperFood, you will remain in awe of what this product can do. Its primary advantage is to promote the body’s anti-inflammatory response, which can help alleviate joint pain. This is one of the perks of turmeric and its potency as this ingredient stimulates the entire body into responding to potential inflammations. The combination of turmeric root and curcuminoids is a powerful mixture that can nurture your brain health and prevent cognitive decline. BioPerine allows your body to maximally use the potential of these two compounds, which can also help you in your search for ideal weight. Due to the potent antioxidant properties, turmeric can also help your body get rid of toxins and promote immunity. A healthy lifestyle is required to accelerate results. Gift cards are not accepted as a form of payment. 1 Q.How Should You Take Turmeric Curcumin Plus SuperFood? Turmeric Plus SuperFood is easy to take as you only need to consume two capsules during the day. The recommended dosage is one pill in the morning and one in the evening. The manufacturer emphasizes that you should take it with a meal for optimal results. 2 Q.How Much Is Turmeric Curcumin Plus SuperFood? A single bottle of Turmeric Curcumin Plus SuperFood costs $22.80 and comes with 60 capsules that will serve you for 30 days. If you want to stack up and save some money in the process, you can utilize the special 3+1 offer in which you get four bottles of the product at the price of $68.40. Turmeric Curcumin Plus SuperFood is a natural health supplement that doesn’t require you to change your lifestyle to see its effectiveness. It promotes your overall body and mind health, and you can see its results almost immediately. The top-rated health supplement focuses on stimulating an anti-inflammatory response that can alleviate joint pain, but it can also play a role in getting rid of extra pounds. The supplement is made by a reliable manufacturer and contains only natural ingredients, which means that you are safe from any side effects. If you were looking for a turmeric-based formula to boost your health, there is no doubt that this is the right one. I have been using Turmeric Curcumin Plus for about a month now and the results are amazing. My last visit to my doctor was a disaster and he suggested that I either start losing weight or start taking blood pressure medication. Well, I’ve lost weight with the help of Turmeric Curcumin Plus and I am no longer in the danger zone for my blood pressure. I haven’t felt this healthy in a long time, I am able to get out and get moving and I also find that digestion-wise things are moving much smoother. Doing tasks are also easier because I found that my mind is clearer. I will continue taking this in the long run to maintain my newfound health. You don’t have to take those dangerous chemicals any more. Vita Balance Turmeric Curcumin Plus is an all natural anti inflammatory that can help lower blood pressure and ease your aches and pains. Most of our joint pain is caused by swelling of the cartilage and tissues surrounding our joints. That’s why we take thinks like ibuprofen. But Vita Balance Turmeric Curcumin Plus takes care of all that, without the dangerous chemicals of ibuprofen. By reducing inflammation in and around our muscles and blood vessels, it helps to lower blood pressure. Circulation is improved, and the body can heal. I decided to try this food supplement because it’s made by Vita Balance, a manufacturer I trust. Not only has Turmeric Curcumin Plus helped boost my metabolism, it has allowed me to maintain proper eating habits. It’s also alleviated some really irritating pain in my lower back, knees, and other joints. Basically, it’s made me much healthier, working both as a superfood supplement to help control my weight, and for joint pain to help me continue regular activity. I would recommend Turmeric Curcumin Plus to anyone looking for the same changes in their metabolism and overall health functioning and increased energy. I’ve had really bad luck picking food supplements over the years because it’s hard to find ones that are all-natural and even organic. That’s what attracted me to Turmeric Curcumin Plus. I’d already tried their joint pain supplements so thought I would also try these food supplements. So far, it’s been great! After about a month, my metabolism is stabilized, I’m losing weight, and I’ve seen absolutely no side effects. I even feel like my overall digestion is much better and I don’t feel bloated or gassy after eating certain foods. I also read it helps with brain function, which will be an added benefit for sure! !